I signed up for over-55 yoga at a recreation centre 6 km away, planning to get up at 6:30 on Thursdays and walk there for an 8 a.m. class. Today was the first class. This week my sister-in-law came to visit from 500 km away. She is close to my age and has decided she wants to do part of the Pacific Crest Trail. (I will refrain from giving my opinion on that.) So together we have been walking up a storm, doing up to 20 km a day together. One thing to note is that she gets up earlier and has also walked to Starbucks and the beach and back (8 km) before I get up. This morning she insisted on accompanying me to the recreation centre. We left a bit late and had to stop for coffee en route, so I realized that I had to hurry. I said I had to rush. She said OK, but she wanted to keep up with my pace for the exercise. I turned my focus ahead. Normally she tends to walk faster than I, with long assertive strides, and I have to hurry to keep up. I have many faults – physical, mental and spiritual – but I like to think I am fairly light on my feet. She isn’t! Picture this… a little old lady (me) scurrying along the sidewalk looking flustered, even jogging at times, followed closely by another almost-senior citizen aggressively marching along just behind. I was struggling with my Starbucks cup, tissues for my dripping nose, unzipping multi layers of clothing as I broke into sweat. I could constantly hear the clomping of her feet and couldn’t seem to pull ahead. Passersby must have wondered why I was being chased by a fierce woman. Finally I wheeled to the left to approach the recreation centre, waving goodbye. (The wheeling was necessary so as to avoid being trampled by her.) I entered the facility with about 60 seconds to spare. When I caught my breath and announced that I was there for a yoga class, my glasses steamed up from the swimming pool air, the clerk said “we don’t have any yoga classes here.” After several minutes we determined that my class was in the NEW facility, about a km away. Approached the correct room. The room had windows so I could observe the class already 20 minutes in progress. Everyone was lying beatifically and serenely on their backs, eyes closed, meditating or whatever. I wiped the sweat off my brow and breathed deeply gasped for air as my heart rate came down to normal. I decided that I was not in condition to enter the room. That would be rude. And unseemly. Embarrassing too. Instead I would relax, sneak peaks through the window during the class, and introduce myself to the teacher at the end. That I did. I took off my hiking boots and several layers of clothes, and quite enjoyed some quality smartphone time while I occasionally looked at the yoga-senior-people so that next week I would not feel left out. They were a collection of various ages (but all old), sizes, shapes and genders, and I would fit right in. Afterward, of course I had to walk home. It was odd to arrive home, exhausted from adrenaline and exertion, before 10:30 a.m. I never did get my day back on track. I am training for a quiet pilgrimage, not the Amazing Race! 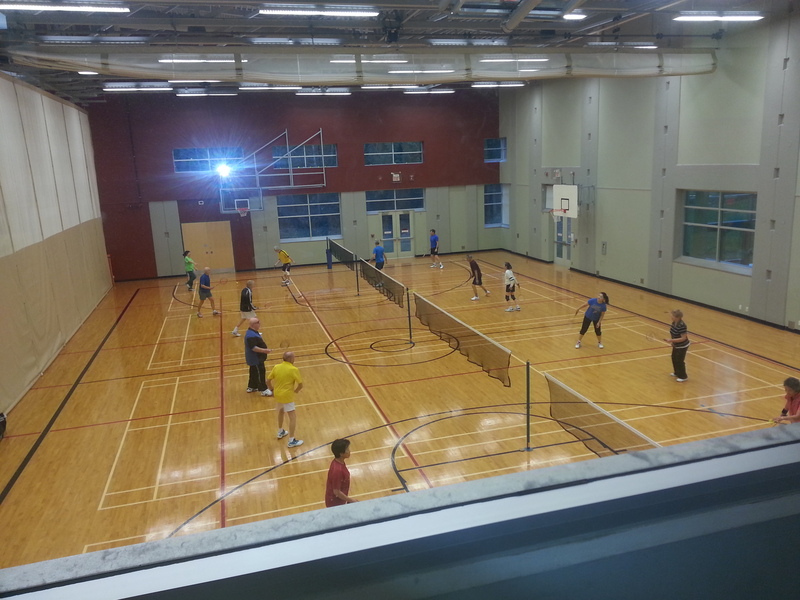 The recreation centre was a pleasant surprise. Maybe I’ll become a regular. I could take up racket sport. I have no idea what they’re doing in this photo. When I took it, I was still coming down from my adrenaline high and didn’t pay attention. Too bad I couldn’t take pictures of the walk there! January 15, 2015 in Misc..
Next time we should walk IN the half-marathon!